Hoffmann, S., Mai, R., Lasarov, W., Krause, J., & Schmidt, U. (2019). Hungry Bellies Have No Ears: How and Why Fundamental Human Needs Inhibit Sustainable Consumption, Ecological Economics, (forthcoming). Lasarov, W.; Hoffmann, S. (2019). Social Moral Licensing, Journal of Business Ethics, (in press). Lasarov, W., Mai, R., García de Frutos, N., Ortega Egea, J. M., & Hoffmann, S. (2019). Counter-arguing as Barriers to Environmentally Motivated Consumption Reduction: A Multi-Country Study, International Journal of Research in Marketing, 36(2), (forthcoming). Orth, U., Hoffmann, S., & Nickel, K. (2019). Moral Decoupling Feels Good and Makes Buying Counterfeits Easy, Journal of Business Research (forthcoming). Reimers, H. & Hoffmann, S. (2019). Transparent Price Labelling for Sustainable Products: A Boost for Consumers’ Willingness to Buy?, Marketing ZFP –Journal of Research and Management, 41(2), (forthcoming). Krautz, C. & Hoffmann, S. (2019). Cross-cultural Application of a Practice-Oriented Acquiescence Measure, International Marketing Review, (forthcoming). Akbar, P. & Hoffmann, S. (2018). Under which Circumstances do Consumers Choose a Product Service System (PSS)? Consumer Benefits and Costs of Sharing in PSS, Journal of Cleaner Production, (forthcoming). Joerß, T.; Akbar, P.; Mai, R.; Hoffmann, S. (2017). Conceptualizing sustainability from a consumer perspective. A qualitative study in the food sector. uwf UmweltWirtschaftsForum, 25 (1), 15-23. Krautz, C.; Hoffmann, S. (2017). The Tenure-Based Customer Retention Model. A Cross-Cultural Validation, Journal of International Marketing, 25 (3), 83-106. Stok, F. M:; Hoffmann, S.; Volkert, D.; Boeing, H.; Ensenauer, R.; Stelmach-Mardas, M.; Kiesswetter, E.; Weber, A.; Rohm, H.; Lien, N.; Brug, J.; Holdsworth, M.; Renner, B. (2017). The DONE framework: Creation, evaluation, and updating of an interdisciplinary, dynamic framework 2.0 of determinants of nutrition and eating, PLOS ONE, (forthcoming). Iskhakova, L; Hoffmann, S. (2017). Alumni Loyalty. Systematic Literature Review, Journal of Nonprofit & Public Sector Marketing, 29 (3), 274-316. Mai, R.; Hoffmann, S. (2016). Indirect Ways to Foster Healthier Food Consumption Patterns: Health-Supportive Side Effects of Health-Unrelated Motives. Food Quality and Preference, (forthcoming). Symmank, C.; Mai, R.; Hoffmann, S.; Stok, F. M.; Renner, B.; Lien, N.; Rohm, H. (2016). Predictors of Food Decision Making: A Systematic Interdisciplinary Mapping (SIM) Review, Appetite, (forthcoming). Görg, H., Hanley, A., Hoffmann, S. & Seric, A. (2016). When do multinational companies consider corporate social responsibility? A multi-country study in Sub-Saharan Africa, Business and Society Review, 122 (2), 191-220. Akbar, P.; Mai, R.; Hoffmann, S. (2016). When Do Materialistic Consumers Join Commercial Sharing Systems, Journal of Business Research, (forthcoming). Iskhakova, L., Hilbert, A., & Hoffmann, S. (2016). An Integrative Model of Alumni Loyalty. An Empirical Validation among Graduates from German and Russian Universities, Journal of Nonprofit & Public Sector Marketing, 28(2), 129-163. Karnal, N., Machiels, C. J., Orth, U. R., & Mai, R. (2016). Healthy by Design, But Only When in Focus: Communicating Non-verbal Health Cues Through Symbolic Meaning in Packaging, Food Quality and Preference, 52, 106-119. Hoffmann, S.; Lee, M. S. W. (2016). Consume Less and Be Happy? Consume Less to Be Happy! An Introduction to the Special Issue on Anti-Consumption and Consumer Well-Being, Journal of Consumer Affairs, 50 (1), 3-17. Haberstroh, K.; Orth, U.; Hoffmann, S.; Brunk, B. (2016). Consumer Response to Unethical Corporate Behavior: A Re-examination and Extension of the Moral Decoupling Model, Journal of Business Ethics, 140 (1), 161-173. Hutter, K.; Hoffmann, S.; Mai, R. (2015). Carrotmob. A Win/Win/Win-Approach to Creating Benefits for Consumers, Business, and Society at Large, Business & Society, 55 (7), 1059-1077. Krautz, C.; Hoffmann, S.; Mai, R. (2014). Konsumentenanimosität: State of the Art und Entwicklung eines kontextsensitiven Erklärungsansatzes, Management Review Quarterly, 64 (3), 125 - 155. Mai, R.; Hoffmann, S. (2015). How to Combat the Unhealthy = Tasty Intuition: The Influencing Role of Health Consciousness. Journal of Public Policy & Marketing 34 (1), 63-83..
Mai, R.; Hoffmann, S.; Schmidt, D. (2014). 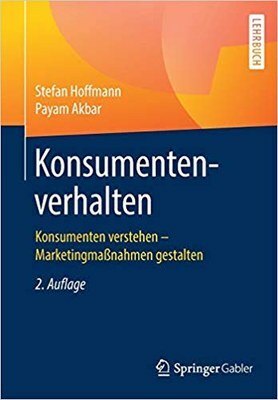 Selektives Demarketing: wie werden Unternehmen unerwünschte Kunden wieder los? Die Betriebswirtschaft, 74 (5), 305-330. Mai, R.; Hoffmann, S.; Hoppert, K.; Schwarz, P.; Rohm, H. (2014). The spirit is willing, but the flesh is weak: The moderating effect of implicit associations on healthy eating behaviors. Food Quality and Preference, 39 (1), 62-72. Mai, R.; Zahn, S.; Hoppert, K.; Hoffmann, S.; Rohm, R. (2014). Tailoring Compensation Effects of Health-unrelated Food Properties, Appetite, 80, 143-153. Mai, R.; Hoffmann, S.; Schwarz, U.; Niemand, T.; Seidel, J. (2014). The Shifting Range of Optimal Web Site Complexity, Journal of Interactive Marketing, 28 (2), 101-116. Hutter, K.; Hoffmann, S. (2014). Surprise, Surprise. Ambient Media as Promotion Tool for Retailers, Journal of Retailing, 90 (1), 93-110. Niemand, T.; Hoffmann, S.; Mai, R. (2014). 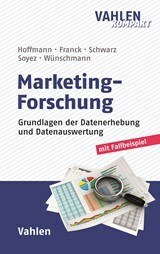 Einsatzpotenziale und Grenzen bei der Anwendung des Impliziten Assoziationstests (IAT) in der Marketing-Forschung, Marketing ZFP - Journal of Research and Management, 36 (3), 187-202. Schwarz, U.; Hoffmann, S.; Hutter, K. (2015). Do Men and Women Laugh About Different Types of Humor? A Comparison of Satire, Sentimental Comedy, and Comic Wit in Print Ads, Journal of Current Issues & Research in Advertising, 36 (1), 70-87. Hoppert, K.; Mai, R.; Zahn, S.; Schwarz, P. E.; Hoffmann, S.; Rohm, H. (2014). Is There a Fit in Cognitive and Sensory Evaluation of Yogurt? The Moderating Role of Nutrition Information, Food Quality and Preference, 31 (1), 65-68. Hoffmann, S. (2013). Are Boycott Motives Rationalizations?, Journal of Consumer Behaviour, 12 (3), 214-222. Hoffmann, S. (2014). Does National Culture Impact Consumer Boycott Prevalence? A Multi-Country Study, European Journal of International Management, 8 (2), 141-159. Hoffmann, S.; Schlicht, J. (2013). The Impact of Different Types of Concernment on the Consumption of Organic Food, International Journal of Consumer Studies, 37 (6), 625-633. Hoffmann, S. (2013). Home Country Bias in the Moral Obligation to Boycott Offshoring Companies, Journal of Marketing Theory and Practice, 21 (4), 371-388. Hoffmann, S.; Fischer, S.; Schwarz, U.; Mai, R. (2013). State of the Art der Forschung zum Interkulturellen Konsumentenverhalten. Eine Analyse der Literatur von 2005 bis 2010, Journal für Betriebswirtschaft - Management Review Quarterly, 63 (1), 121-135. Hoppert, K.; Zahn, S.; Jänecke, L.; Mai, R.; Hoffmann, S.; Rohm, H. (2013). Consumer Acceptance of Regular and Reduced-sugar Yogurt Enriched with Different Types of Dietary Fiber, International Dairy Journal, 28 (1), 1-7. Hoppert, K.; Mai, R.; Zahn, S.; Hoffmann, S.; Rohm, H. (2012). Integrating Sensory Evaluation in Adaptive Conjoint Analysis to Elaborate the Conflicting Influence of Intrinsic and Extrinsic Attributes on Food Choice, Appetite, 59 (3), 949-965. Mai, R.; Hoffmann, S. (2012). Taste Lovers vs. Nutrition Fact Seekers: How Health Consciousness and Self-Efficacy Determine the Way Consumers Choose Food Products, Journal of Consumer Behaviour, 11 (4), 316-328. Müller, S.; Hoffmann, S.; Schwarz, U.; Gelbrich, K. (2012). The Effectiveness of Humor in Cross-Cultural Advertising, Journal of Euromarketing, 20 (1/2), 7-20. Hoffmann, S.; Liebermann, S.; Schwarz, U. (2012). Ads for Mature Consumers: The Importance of Addressing the Changing Self-view between the Age Groups 50+ and 60+, Journal of Promotion Management, 18 (1), 60-82. Mai, R. (2011). Der Herkunftslandeffekt: Eine kritische Würdigung des State of the Art, Journal für Betriebswirtschaft, 61 (2), 91-121. Hutter, K.; Hoffmann, S. (2011). Guerrilla Marketing. The Nature of the Concept and Propositions for Further Research, Asian Journal of Marketing, 5 (2), 39-54. Hutter, K.; Hoffmann, S. (2011). Guerilla Marketing - eine nüchterne Betrachtung einer viel disktutierten Webeform, der markt - International Journal of Marketing, 50 (2), 121-135. Mai, R.; Hintermeier, J. (2011). Regionaler Dialekt in kommerziellen Interaktionen: Vorteil oder Nachteil für Mitarbeiter mit direktem Kundenkontakt? der markt - International Journal of Marketing, 50 (4), 219-232. Hoffmann, S. (2011). Anti-Consumption as a Means of Saving Jobs, European Journal of Marketing, 45 (11/12), 1702-1714. (Highly Commended Award Winner at the Literati Network Awards for Excellence 2012). Hoffmann, S.; Schwarz, U.; Müller, S. (2011). The Ambivalent Effects of Website Complexity, International Journal of Internet Marketing and Advertising, 6 (4), 413-433. Mai, R.; Hoffmann, S.; Helmert, J. R.; Velichkovsky, B. M.; Zahn, S.; Jaros, D.; Schwarz, P. E. H.; Rohm, H. (2011). Implicit Food Associations as Hurdles for Healthy Nutrition: The Necessity of Further Research, British Journal of Diabetes and Vascular Disease, 11 (4), 182-186. Hoffmann, S.; Soyez, K. (2010). A Cognitive Model to Predict Domain-specific Consumer Innovativeness, Journal of Business Research, 63 (7), 778-785. Müller, S.; Hoffmann, S. (2010). Internationale Markennamen: Die Standardisierungs-/Differenzierungsentscheidung anhand linguistischer Kriterien, der markt - International Journal of Marketing, 49 (1), 43-51. Mai, R.; Hoffmann, S.; Müller, S. (2009). Die asymmetrische Wirkung eines Akzents in der Werbung, Marketing - Zeitschrift für Forschung & Praxis, 31 (4), 255-265. Schwarz, U.; Hoffmann, S. (2009). Wer lacht über humorvolle Werbung? Der Einfluss von Kultur und Geschlecht, transfer - Werbeforschung & Praxis, 55 (2), 19-30. Hoffmann, S.; Müller, S. (2008). Intention postgradualer Bindung: Warum Studenten der Wirtschaftswissenschaften nach dem Examen dem Alumniverein beitreten wollen, Schmalenbachs Zeitschrift für betriebswirtschaftliche Forschung, 60 (3), 570-600. Hoffmann, S.; Müller, S. (2007). Externes Wissensmanagement zur Steigerung der Effizienz von Entsendungen von KMU, Zeitschrift für Betriebswirtschaft, 76 (6), 99-123.